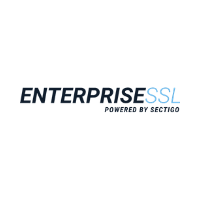 The EnterpriseSSL Pro with EV certificate is issued by Sectigo. Includes support for ECC technology providing stronger faster encryption and includes business validation with the Green Address Bar. Get the Green Address Bar for the most trust from your users. Get the latest SHA-256-bit encryption to protect your site. Protect your business with a $2.0 million warranty.